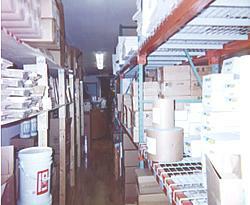 Niles Color Center is certain to have all the floor supplies you need from abrasives to finishes. Our company is largely based on the floor finishing business and we carry numerous top name brands. We are one of the top sellers of Norton abrasives in the world. At the last floor convention we received an award for our sales. We have the best prices around! We carry many other types of equipment for your floor finishing needs. We have numerous sizes for rolls, belts, screens, edger discs, floor maintenance pads, and discs. For specific sizes and price quotes please call us at (847) 967-9585 and we'll be happy to assist you. We also have a large supply or floor finishes. Look below for various types of finishes and the brands that manufacture these finishes. Acid cured urathanes are the most durable of all the other products. They are fast drying, resist yellowing, and are very flammable and hazardous. After using these products you should be out of the house for at least 48 hours. Because of the nature of these products, they are only sold to the professional floor sander. Brands include Glitsa, Synteko and Vermeister Kristal. There are two types of these urethanes: regular and non-yellowing. In this product, the moisture helps cure the product (just the opposite of the other finishes). The humidity in the the air will affect the drying time. Again, because of the nature of this product, we must restrict the sale to only the professional floor sander. Niles Color Center only recommends Harco if you plan on using Moisture Cure Urethanes. Waterborne finishes are newer than the other finishes and are environmentally safe. This type of finish is the fastest growing product in the flooring industry as well as for the consumer. The product itself is durable, almost odorless, and dries quickly. Due to the clear color we have an amberizer that will give you the polyurethane look with a water product and the ease of water clean-up. Brands include Basic Coatings, Bona Kemi, Dura Seal, Infinity, and Diamond. Polyurethanes are the most common floor finish. It has an amber cast and ambers more with time in most cases. Less light will help the finish amber faster. Our Niles Center super poly (90, 92, 95) will have a slight ambering effect. Brands for this type of finish include Basic Coatings, Dura Seal, Harco, Varathane, and Zar. Wax is a very good protection. However, before you put wax on you must be sure that you want wax. Unfortunately, once you put the wax on you must take it all off before putting any other finish over the floor. Waxes that we carry are made by Dura Seal. Staining your hardwood floor makes your floor shine even more! We at Niles Color Center do the best matching of stain or paint by anyone. We specialize in custom colors. Bring in your sample with the wood you are using and we will make you a sample. Some of the stain brands that we carry include: Dura Seal, Woodline, Glitsa, Minwax, Pratt and Lambert, Zar and Niles Fast Dry Stains. We are one of the top sellers of Norton abrasives in the world. At the last floor convention, we received an award for our sales. We have the best prices around. We carry 8", 10" and 12" 50 yard rolls 8" in grits from 180(5/0) to 12(4 ½) Norzon from 120 to 36 8" x 50 Norzon paper back from 100 to 36 8x25 cloth back 120 to 24 (No 30). We carry 15", 16", 17", 18", 19", 20"
15" x 2" and 16" x 2"
We also carry square buff discs, screens and buffing pads and a lot more special types of abrasives. Copyright ©2000, 2001 - Niles Color Center, Inc. All rights reserved. Site designed and hosted by Mustang Internet Services, Inc.